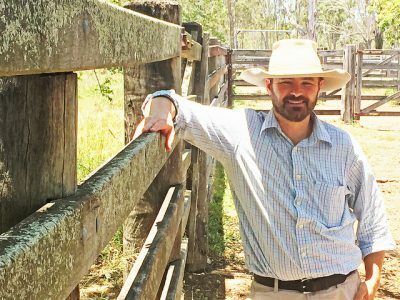 ABOUT 10,000 cattle on properties and feedlots in NSW will be fitted with commercially-available eartag monitoring devices as part of the largest real-time cattle health pilot ever conducted in Australia. US-based precision livestock and remote animal health monitoring solutions provider HerdDogg will provide its eartags, called DoggTags, as part of the MLA-funded project. The goal is to provide earlier indications of animal illness, to improve overall animal health, and to test a new long-range bluetooth system capable of transmitting biometric and proximity-based behaviours at a distance of 300 metres from the DoggBone eartag readers. 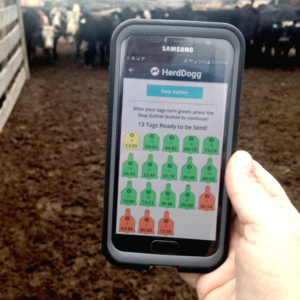 the HerdDogg mobile app (provides anytime/anywhere access and alerts for each animal’s health record, accessed via the cloud and at HerdDogg.io. Melissa Brandao, founder and CEO of HerdDogg said until now, technology solutions for the beef industry had been expensive and unsuitable for remote areas, whereas her company’s low-cost HerdDogg system was designed for grazing operations. “For this trial, we’re eager to prove that HerdDogg can provide animal managers with early warning of illness by automating the analysis of animal biometrics. This delivers two important benefits: reduced labour costs and improved animal health and wellbeing,” she said. Data gathered will be made available to Australian researchers to further develop insights for the benefit of HerdDogg’s offering and the advancement of the Australian meat and livestock industry. “Despite significant private-sector activity in this area, we have yet to see a commercial solution that Australian producers can easily buy off the shelf and implement on an extensive grazing property,” said Sean Starling, MLA’s general manager of research, development and innovation. “We’re eager to see how the HerdDogg system can impact on the way livestock are managed across the industry and bring significant economic and non-financial value,” he said. Data gathered during the pilot project will be used to enhance HerdDogg installations already underway in Australia. Australian researchers such as Mark Trotter, associate professor of precision livestock at Central Queensland University, are eager to see wider deployment of tags across different Australian grazing systems, because this would allow researchers to really explore a rich data set from which a range of behavioural algorithms and alerts can be developed. “We are currently testing the HerdDogg system on cattle here at CQU,” Prof Trotter said. HerdDogg aims to capitalise on a growing industry that is hungry for animal biometric data. Is this animal ill or injured? Is this animal in the right pen or paddock? HerdDogg requires minimal technical expertise and provides immediate insights without any previous health history or animal records. In earlier field trials in the US, the company says farmers have seen two to three-day early detection of illness, and received real-time status updates on heats and missing animals, enabling them to get out to the animals faster. HerdDogg says it is already responding to strong demand through its market presence in North America, Australia, and Brazil. Headquartered in Ashland, Oregon, HerdDogg Inc is a venture-backed agtech startup focused on increasing herd happiness by deriving unparalleled insights into key indicators of animal health and wellbeing. The HerdDogg system provides rapid and accurate breeding and health insights on individual animals, whether in the barn or pasture. HerdDogg claims to reduce labour costs while increasing herd productivity and sustainability. For more information, visit www.herddogg.com. The website says the tags start at $48 each. Which would be US$ as well. At those sorts of prices I can only see the stud stock sector finding a viable use for it. I fail to see point of the 10 000 head trial if the tags are going to be so expensive to be unviable for the commercial sector from the start.